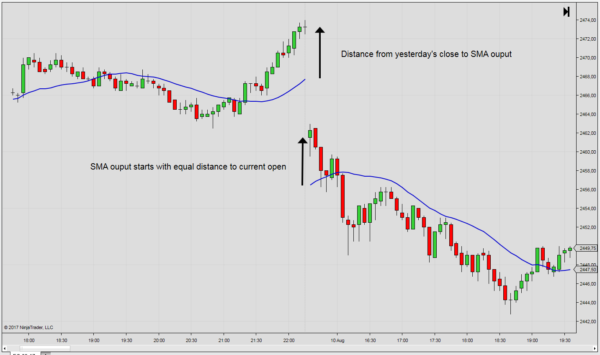 By eliminating the effect of the overnight gap, the Gapless SMA transitions smoothly between the previous close and the current open. Instead of waiting for the lookback period to eliminate a gap from its calculation, the Gapless SMA can be used immediately because it automatically adjusts to any overnight gap. The Gapless SMA is used for instruments and session templates that have a price gap between yesterday’s close and the current open. Overnight gaps occur with instruments that do not have an overnight trading session. For example, the FDAX benchmark index for the Germany equity market is closed from 10:00 PM until 8:00 AM local time. Therefore, significant fluctuations in Asian markets may create price gaps that reflect the overnight price action. This represents a challenge for the traditional SMA because the gap is factored in as part of the lookback period. Therefore, at the start of the new session, you’ll have to wait until the gap is eliminated from the SMA lookback period before using it. 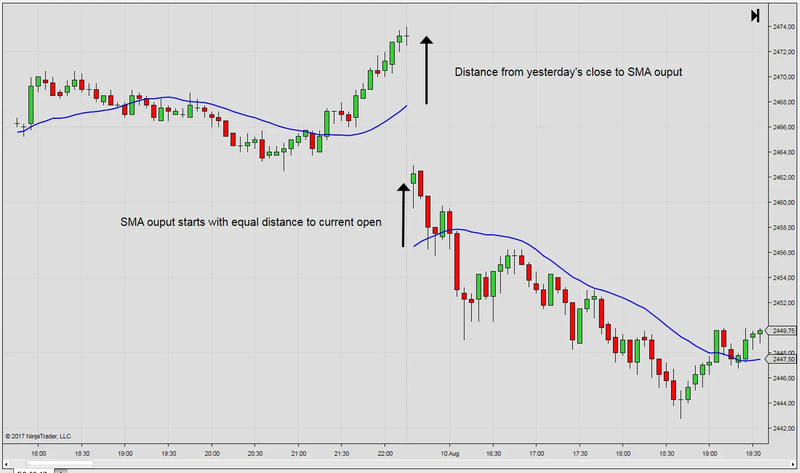 Specifically, the moving averages used in the Gapless SMA, measures the difference between the prior day close and yesterday’s last indicator plot, transferring it to the current open. Other than adjusting for the overnight gap, the indicator also comes with an option to reset the calculation to start at the current open.